The one bright side to the demise of Broken Social Scene is that the members now have more time to concentrate on their other projects. For Brendan Canning it comes in the form of his longstanding Cookie Duster group, who released their new album When Flying Was Easy earlier this week. The record kicks off with the spacey, melodic "Cut Me, Focus". 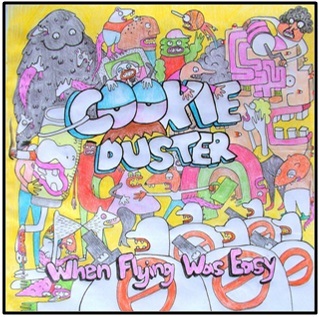 There's more than a little affinity for the trippy, as Cookie Duster revisits the atmosphere often, as on "No Solo (With Bass Gtr)". 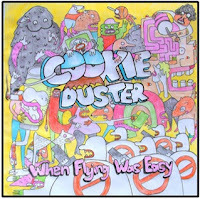 Cookie Duster are a rare band that seem as comfortable with electronic dance hooks ("Cruel Summer") as they are with garage rock power chords ("Black Car"). The album may very well spawn two of the most infectious tracks of 2012 so far. The perfectly-paced "Daddy's Got the Medicine" is catchy and mesmerizing, while the frenetic "Two Feet Stand Up" features Jeen O'Brien doing a better Emily Haines than Emily Haines. O'Brien really is the band's secret weapon. When you hear her voice at the start of a song you instantly perk up and take notice. She shows the rare ability to be cutesy and at the same time fiendish on "Standing Alongside Gone". Compelling and almost mystical, When Flying Was Easy is a record that slowly grabs your attention. Before you know it Canning and company will have their fists firmly clenched around your musical soul. Best tracks: "Daddy's Got the Medicine", "Two Feet Stand Up"